The Garden Leaves are Everywhere. 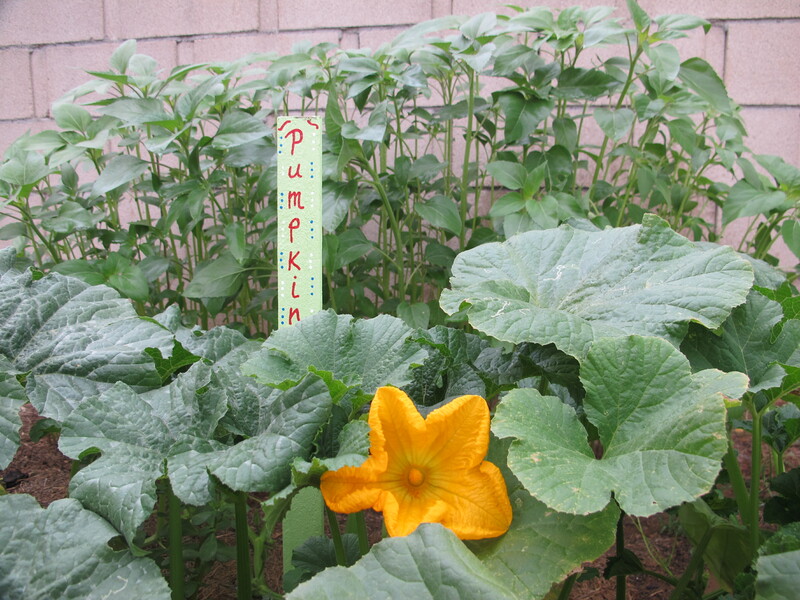 This year in my garden I have zucchini plants, pumpkins, butternut squash, watermelon, and sunflowers. All of these plants have amazing leaves. I’ve been a little mesmerized by the different shapes and sizes of the leaves from each plant. 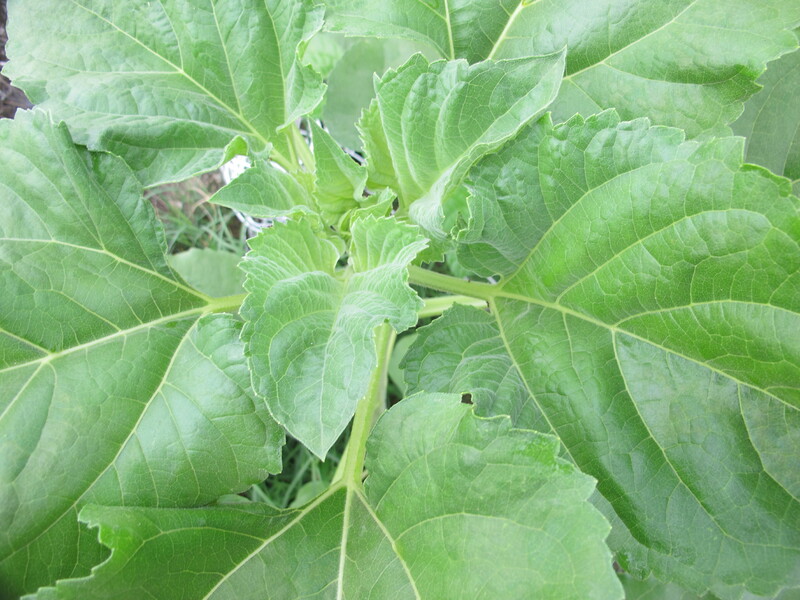 And I don’t know that I ever realized or paid much attention to the distinctive leaves of each plant. Zucchini leaves are huge. All of the leaves protect the blossoms in one way or another. 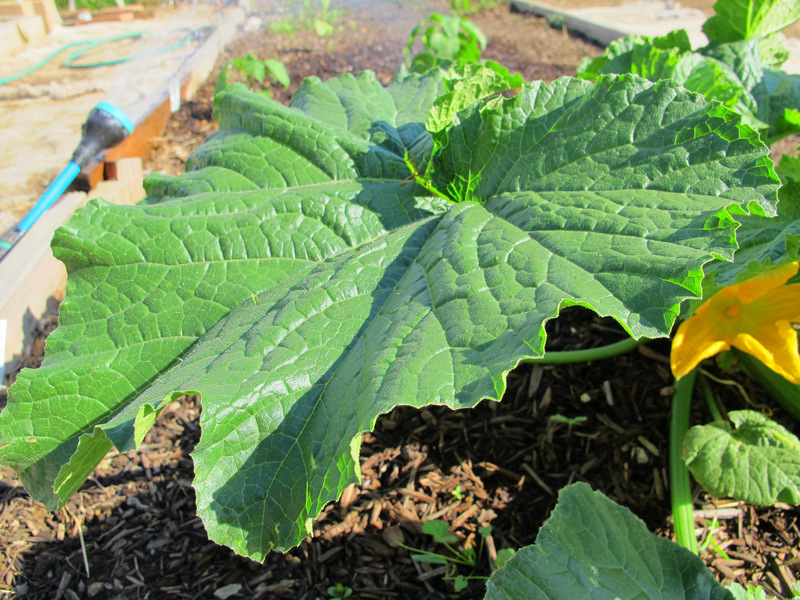 The zucchini leaves are by far the largest of them all. And isn’t it amazing how the leaves protect the plants, and camoflauge them? I was picking some zucchini tonight, looked at the same plant twice before I realized there was a really good-sized zucchini laying right on the ground, in plain sight. Pumpkin leaves are next. I was also trying to get pictures of the little blossoms. They spread out in long trails, so make sure you have lots of room to plant and let them grow. Pumpkins are in the foreground. The leaves in the background are a patch of sunflowers. 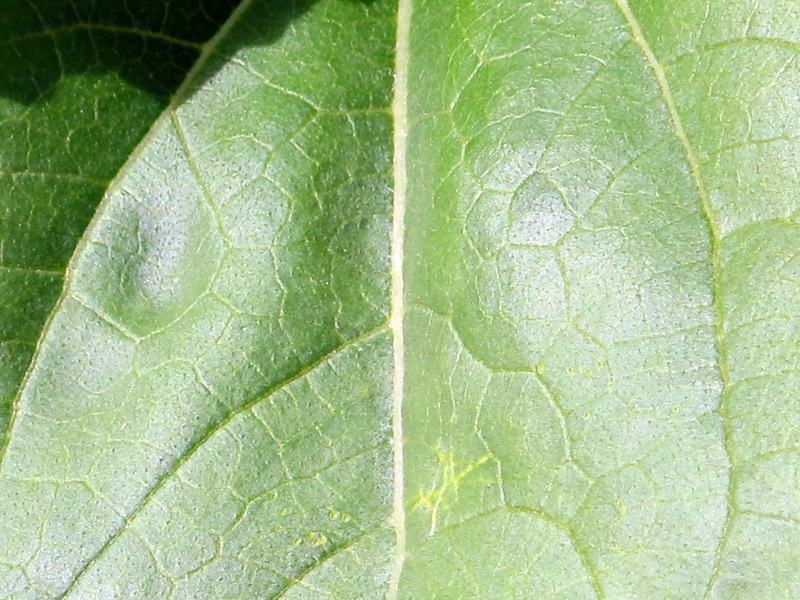 The watermelon leaves have a shape and size all their own. 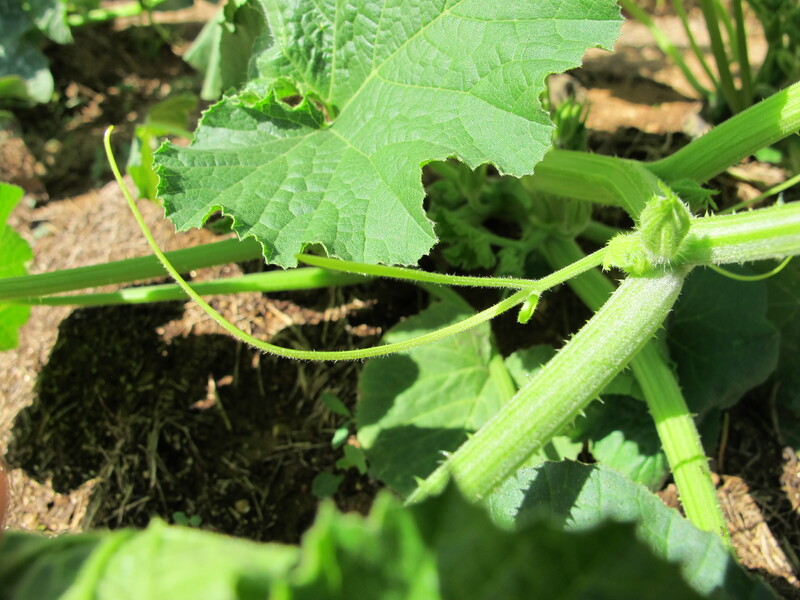 Very curvy and a little lighter green than the squash family of plants. These leaves trail out into the garden too. sometimes those trailers have to be redirected so they don’t get tangled up in a fence or a tree. And look at my little baby watermelon, so cute. This picture was taken about a month ago. 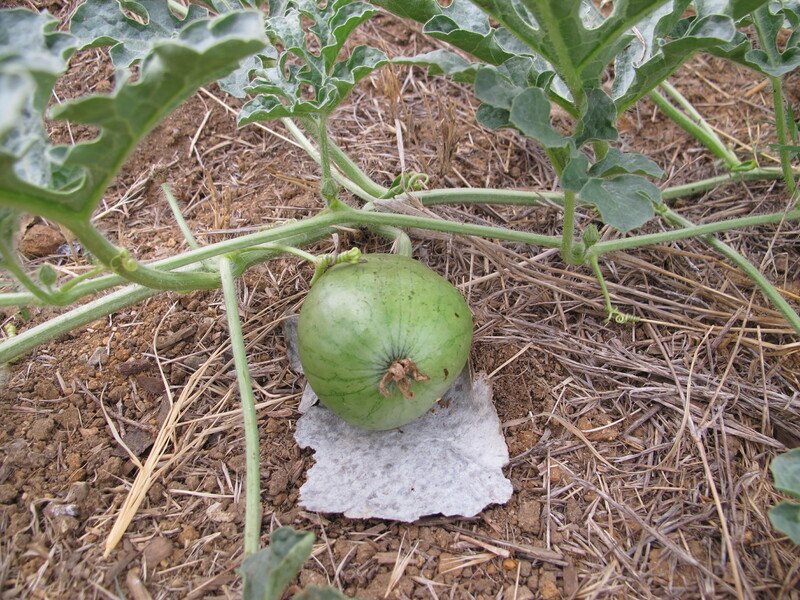 The melon is about 3 or 4 pounds now. This is the first time I’ve ever grown watermelons. I’ll let you know how they turn out soon. 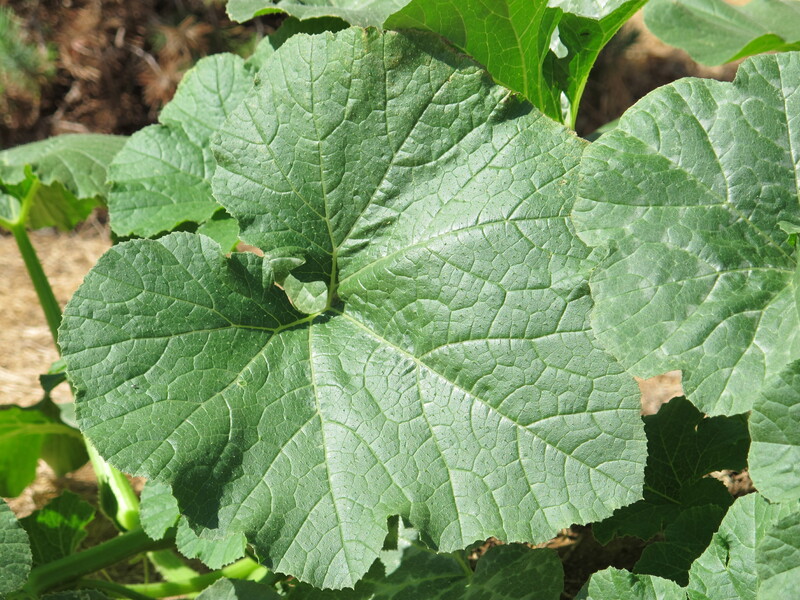 Then there’s the butternut leaves. Very similar to the pumpkins in shape and size. These leaves trail all over the place. I have a big area designated just for the bountiful butternuts! The sunflowers were planted just for Evan. Actually he planted these seeds himself, and has been watching their progress over the summer. Evan’s method of planting the sunflower seeds was just pushing them into the mud in this little patch we designated for them. It is still so amazing to me that one little garden can produce so much greenery. I’ve just been fascinated by all of the leaves and greenery. The way the squash family of plants, in particular, have a natural way of camoflauging, or become an umbrella to the vegetables underneath is a wonder all its own. Did you have you garden this summer? Do you have a green thumb? If you only planted one thing in your garden my vote would be for a zucchini plant, For me they have the most amazing leaves of all. Happy gardening everyone. I’ve seen lots of ideas for container gardening. and I know Home Depot has a table kit you can build now for patio gardening. Best of luck. Thanks for stopping by.